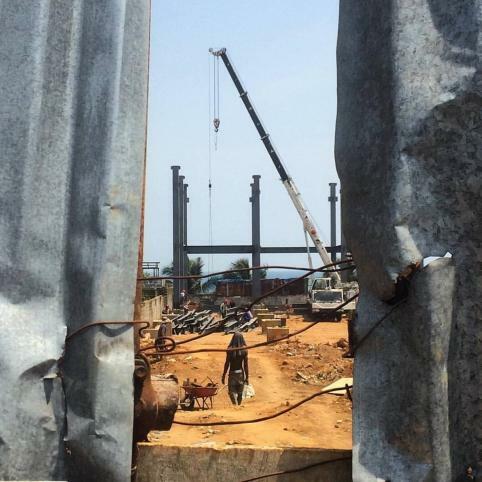 Can Liberia escape the "resource curse" by demanding more from foreign investors in the natural resource sector? The Liberian government has granted more than a third of the country's land to investors through concession agreements. Source: Government of Liberia, 2010. This map was provided by Dr. Lucie Phillips of IBI International. It is republished it with permission from Liberia's Ministry of Planning and Economic Affairs. In exchange for contractual rights to extract and export natural and nonrenewable resources, the central government has required that foreign investors build and maintain public infrastructure, such as roads, bridges, ports, and electricity grids. Its goal is to target and co-locate these infrastructure investments in specific geographic areas in order to set in motion broader economic agglomeration processes and establish new "growth poles" or "development corridors." Natural resource concessions improve local economic growth outcomes. Mining concessions have a positive effect on local economic growth outcomes. Corporate social responsibilty (CSR) projects do not have detectable effects on local economic growth outcomes. U.S. concessions do not have any discernible effect on local economic growth, while Chinese concessions do. Pioneering innovative new research methods leads to a more complete picture. 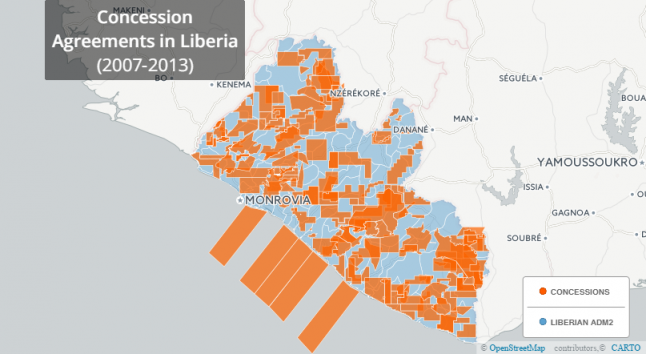 In partnership with the Concessions Working Group in Monrovia, AidData developed a first-of-its-kind dataset of all known natural resource concessions granted to investors in Liberia from 2004 to 2015. We systematically categorized 557 concessions on 43 different dimensions, including the names and nationalities of the investors, the nature of the rights granted to these investors (exploratory or extractive), and the presence or absence of contractual commitments to undertake corporate social responsibility activities. We also developed a novel, polygon-based (rather than point-based) geocoding methodology that identifies the specific tracts of land granted to investors to explore, develop, extract, or sell natural resources. Using geospatial impact evaluation methods, our research team estimated the effects that different types of concessions and concessionaires have on local economic growth outcomes. We did this by first constructing polygons that correspond to the specific tracts of land granted to investors, which made it possible to calculate at a high-level of spatial resolution if particular locations had been “treated” with FDI activity. We then merged these geocoded investment data with a remotely sensed outcome measure of nighttime light growth at the 1km x 1km grid cell level. To establish a credible counterfactual, we used data from satellite imagery, weather stations, household surveys, and administrative records and propensity score matching methods to identify pairs of treated and untreated locations that were equally likely to receive natural resource sector FDI. We then calculated the difference between nighttime light growth in the treatment group and the control group.